Here is my 37th Church Micro. Your looking for a magnetic nano. Tweezers or hair grip needed to extract the log, also bring a pen. Please just Initial the Log and don't put a date! Baptist chapel. Dated 1831. 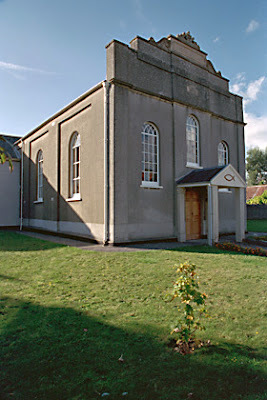 Rendered and scribed as ashlar, end pilasters, moulded cornice, slate roof, parapet with elaborate central section surmounted by a fielded stone plaque inscribed:- "BAPTIST CHAPEL", plaque with flanking stone scrollwork and a decorated "pediment", plain band below. Symmetrical, 2 storey frontage; 1:1:1 bays, that to centre breaking forward slightly, semi-circular headed 20-pane fixed-light windows, heads with Gothic glazing. Datestone set above centre window:- "1831". Central door opening, paired 3-panelled doors; pedimented portico on 2 plain square piers, Corinthian pilasters to wall. Returns of 2 bays each, semi-circular headed windows. Late C19 wing at right angles to right return not included in this list. Credit Images of England.org. Please rehide as found. I didn't realise Cheddar Village was empty of caches. A log on my St Andrews CM saying no other churches in Cheddar then?, prompted me to place the latest 3. Gryrtencu cbyr fgenvavat fgenc haqrearngu ghpxrq oruvaq guernqrq one.